First things first, you should backup any important documents. You shouldn’t lose any files during this process, but it’s better to be safe than sorry. When you’re ready, we’ll need to create some space for Windows 8 on your hard drive. 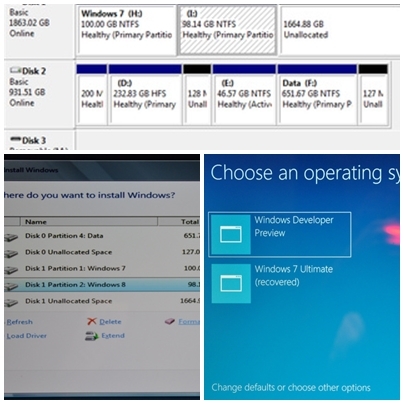 (partitioning)- Open the Start Menu and right click on the “Computer” option. Click “Manage”, and in the window that appears, click on “Disk Management” in the left sidebar. This will open the Disk Management console. You should see a big (or small) list of all the drives currently attached to your computer. Find the drive that Windows 7 is installed on (it should be marked as “Boot” or “System”), right click it, and click Shrink Volume, (you ideally need a figure that’s around 50,000MB (50GB). If your hard drive is very full, this might not be possible. In theory the minimum install size for Windows 8 is around 20GB, but I really wouldn’t proceed without at least 30-50GB. ) Then, click on the “Unallocated” block of that drive that appears and click “New Simple Volume”. Click Next on the next few windows until you get to the “Format Partition” window. Here, give it a volume label you’ll recognize (like “Windows 8”) and click Next. It should format the drive for you. Now you’re all set to install Windows 8.